Scotland's lowland canals were a triumph of their age, and their restoration to use has been a much more recent triumph. Two main canals were built, the Forth & Clyde Canal linking the River Forth at Grangemouth with the River Clyde at Bowling, and the Union Canal, linking the Forth & Clyde Canal near Falkirk to the edge of the centre of Edinburgh. As the author says in his introduction: "In the canals' heyday during the early nineteenth century, the lack of locks on the Union Canal allowed travellers a speedy crossing between the cities of Edinburgh and Glasgow. The once-thriving service took as little as 13 hours, and cost the equivalent of 7.5 pence." The coming of the railways ensured that heyday was a brief one, and the canals were soon in steep decline. By the 1990s they had virtually ceased to exist, overgrown, in parts filled in, and in others cut by later development, including the M8 motorway. The return to use of the canals under the banner of "The Millennium Link", starting in 1994, has given central Scotland a wonderful resource, as well as amazing attractions such as the Kelpies and the engineering marvel of the Falkirk Wheel. "Canals Across Scotland: Walking, Cycling, Boating, Visiting", to give it its full name, is a perfect companion to the canals, allowing visits to be planned and to be enjoyed to the full. It provides detailed towpath information, including maps of the towpaths themselves and of the areas passed through, and suggests what to see and do both on the canals themselves and more widely. Hamish Brown's credentials as an author will be well known to anyone who cares about and reads about Scotland, and the book is full of fascinating historical background, descriptions, stories, and practical information. It is copiously and beautifully illustrated, with modern colour images and some historical black and white or sepia photographs. It also describes side trips along the Roman Antonine Wall, or through towns like Linlithgow, Falkirk, Kilsyth and Kirkintilloch. 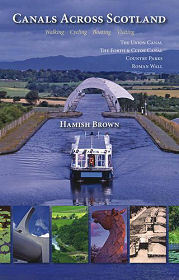 This is an ideal book for anyone who likes their walks (or cycle rides) flat rather than hilly!